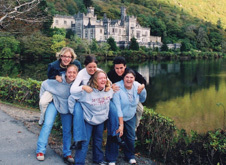 This program is designed to give students an opportunity to explore the richness of modern Irish life in a unique context, where U.S. and European students come together to share the study abroad experience. Dublin provides the backdrop – exciting, dynamic, young, diverse, and a place where the old and the new blend in perfect harmony. You'll participate in a sequence of on-site activities, projects, and team tasks that help you learn by doing. Built by the Vikings on the river Liffey during the 9th century, the former "Kingdom of Dublin" is Ireland's largest city and haven to Europe's youngest population. Hundreds of U.S. companies make Dublin their home, thanks to the Irish city's strategic location as a gateway to the European Union. A diverse citizenry of more than 100 different nationalities, some of the most famous pubs in the world, and a rich cultural, literary, and artistic heritage are all part of Dublin's appeal. Experience centuries of British influence as you explore Dublin's elegant Georgian squares, spacious parks, and impressive public buildings. Live in the place where generations of famous Irish playwrights, writers, musicians, and singers have found inspiration. Get to know firsthand the city's modern-day mix of recent immigrants from Poland, Hungary, the Czech Republic, and the Baltic States. The opportunities to examine Dublin's old and new culture are endless.